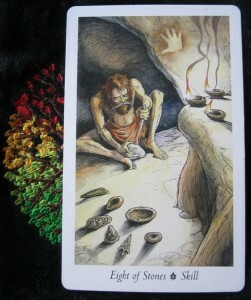 This week’s Tarot card reading comes from the Stones suit of The Wildwood Tarot, with the keyword of “skills”. Combined with the context of “What we can Change”, we’re entering into an interesting time! The Eight of Stones is often about taking stock, developing and honing our skills. As the image depicts, it shows someone who has isolated themselves to craft items of use from oil lamps and arrow heads to bowls and other tools. The trick for the reminder of this week (as Scorpio’s influence hits us on three sides from Saturn, Venus and the Moon) as we dig deep and find the skills within. This could be a time to start a new project for the winter (patchwork quilt, anyone?) that calls on new skills, or further stretches the skills we already have. This time of year is also quite popular for Tarot Readings, as a lot of people finally give time to themselves and start to change things that haven’t been working so well so far this year. With only five months of the year left, the nights drawing in, the time for frolicking outside in the warm evening air departs. Summer is still with us, but the heat has gone, we’re on simmer (or the back burner). It’s homework time! What skills do you need to brush up and improve upon? What new skills would you like to learn or investigate on learning this coming winter? Now is the time to start planning, investigating and ordering the books for reference that you’ll need. The other thing you’ll need is practice! Keep at it, even if at times, you don’t feel like it’s going anywhere. You won’t be sewing garments like a professional seamstress at the start, but if you keep practising and trying, improving with each stage, you’ll be there soon enough. 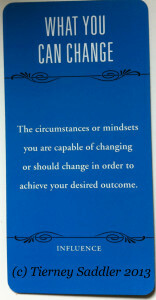 Like Tarot reading, all and any practice makes perfect! I’d love it very much if you shared my blog entries. I love sharing! Deck used was the Wildwood Tarot, illustrated by Will Worthington, deck by Mark Ryan and John Matthews. Context card is from Tierney’s Saddler’s Deck of 1000 Spreads. Hah! Love it! I was planning to write about the 8 Pentacles/Stones today, too! Love the synchronicity 🙂 I <3 Wildwood. Ok…I think I fixed the comments…! This is, indeed, a week of taking stock for me. My reflections are more inward about who I am as a person, but that sets the stage for examining what I will do with my skills and personal qualities. I love the burrowing in of fall. It is, indeed, a time to get organized, get busy, and honor the remaining months of the year. 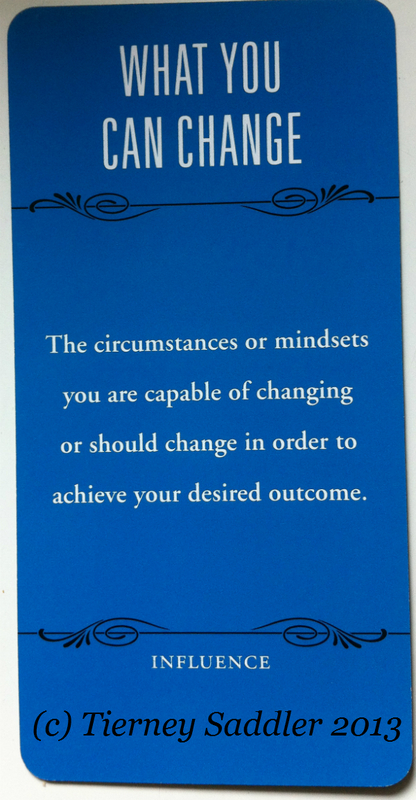 The question “what can we change?” is a get driving force. I’ve come to really enjoy these Tarot card posts – a totally new way to explore for me. I love what you wrote about practice – I find myself not releasing anything because it is not yet perfect and then I throw it to the wayside and never complete it. I think I have about 50 projects (at least) like that. Perhaps I just need to go back to those and use the skills I’ve obtained since tossing them and make them fresh! And then just release them BEFORE they are perfect! Wonderful to read that now is a good time to start projects – desperately trying to get the second book done! Always enjoy your point of view Louise. Much to chew on, and yes there are a slew of projects that need organizing and completion. One is more time with my astronumerology. I love it and don’t give it enough time because somewhere in my head I think its a luxury. I am planning on increasing my astro knowledge and skills and also my writing skills. I have a busy winter planned! Interesting. Hone up on skills and maybe learn new ones. What is in the offing?